How could I forget this place on the road to Norwalk. Sure, it closed in late 2007, and could have used any publicity it could get. Rumour was this place was operated by some people connected to a major high-end restaurant chef in Des Moines. I probable should have added this review a long time ago. Watching tenderloin serving establishments close brings me no shortage of heartache. 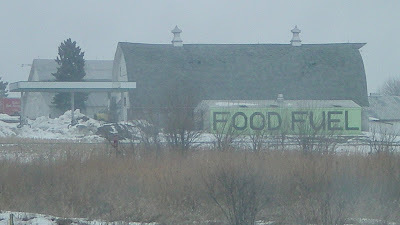 Location: listed as 1643 R63 Hwy in Norwalk, this is right on the off ramp from the southern Highway 5. Directions: You could get there by going south on 9th St in Des Moines or by taking the turnoff from the loop highway south of town. 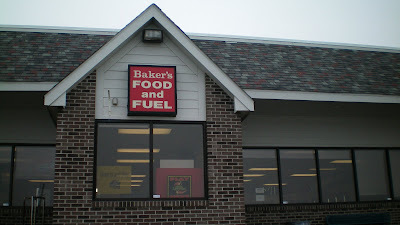 Look for the giant FOOD and FUEL sign. The Tenderloin: I was greeted by a printed sign on the swinging doors advertising homemade tenderloins. 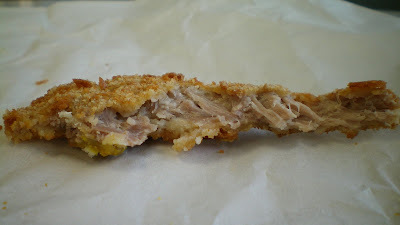 This was a great hunk of darker pork meat with great taste that came apart easily. There were a couple places where the fat wasn't trimmed off, but the great variance in shape and thickness made it all good. Served on a large untoasted bun. The fixins bar for patrons bumped up the score with banana peppers and jalepenos in addition to the usual toppings. Overall 7.5 out of ten. Price: $4.25, with fixins bar. Also on the menu: Large menu included Grinder Sandwiches, "Hawg Wings", gizzards and pizza kept under hot lamps. Service: You pick up your food from the counter, the fixins bar is behind you. You could call ahead to order pizza. When I found the hot food cabinet sans Tenderloins, the lady working the register agreed to make one. She then took three tenderloins with very different shapes out of the freezer storage. I got one fresh hot one, the other two sat under the heat lamp. Ambiance: This was a spacious and well lit gas station with TVs stuck on the country music channel and a nice bulletin board. Final Thoughts: Its a shame this place had to close. 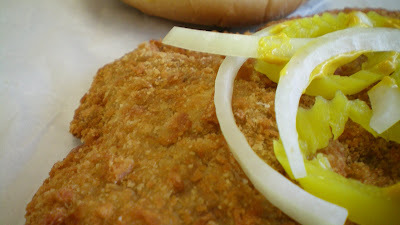 The tenderloin is about the best that you would ever be able to find with a tank of gas. I probable should have added this review way back before it closed, but I figured it was a case of better late than never. 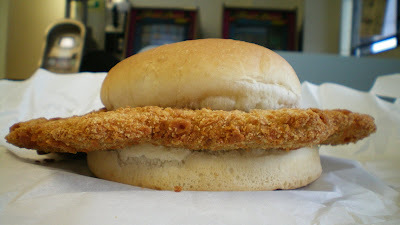 When places serving tenderloins disappear, it reminds me to keep supporting the small places that make eating tenderloins so much fun in the first place.